A COMPARATIVE STUDY OF MICROLEAKAGE OF OBTURATED ROOT CANALS AFTER DISINFECTION WITH Nd:YAG LASER, PDT AND NAOCL AND EDTA. Tzvetelina Gueorgieva 1 , Maria Dencheva2, Julia Kamenoff3, Vasil Kalchinov1, Margarita Vasileva4. Endodontic therapy consists of cleaning and shaping the root canal system, removing organic debris and sealing the intracanal space with permanent filling materials. The use of lasers and photo-activated disinfection in endodontic treatment may cause morphological changes in the dentin of the root canal. The purpose of this laboratory study was to compare the degree of hermetic obturation of root canals after endodontic treatment and disinfection with Nd: YAG laser, photo-activated disinfection with FotoSan, NaOCL 2,5% + EDTA 17% and obturated with AH 26 sealer and gutta-percha. For the laboratory study we used 30 freshly extracted single rooted teeth. After that the teeth are divided into three groups, depending on the mode of additional root canal disinfection and obturated. The leakage was shown using dye penetration test with methylene blue for a period of 3 days at 37°C. Microleakage was observed in all studied groups. Gueorgieva Tz, Dencheva M, Kamenoff J, Kalchinov V, Vasileva M. A comparative study of microleakage of obturated root canals after disinfection with Nd:YAG laser, PDT and NaOCL and EDTA. J of IMAB. 2013 Jul-Dec;19(4):415-418. doi: 10.5272/jimab.2013194.415. 6. Sousa-Neto MD, Silva Coelho FI, Marchesan MA, Alfredo E, Silva-Sousa YT. 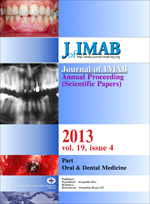 Ex vivo study of the adhesion of an epoxy-based sealer to human dentine submitted to irradiation with Er: YAG and Nd : YAG lasers. Int Endod J. 2005 Dec;38(12):866-70. [PubMed] [CrossRef].